Utah snowpack basin-filled map December 38, 2018 via the NRCS. Compared to last year’s lackluster winter and poor runoff this spring, many of the basins are reporting good numbers for the percentage of “snow water equivalent” that has accumulated compared to the median. 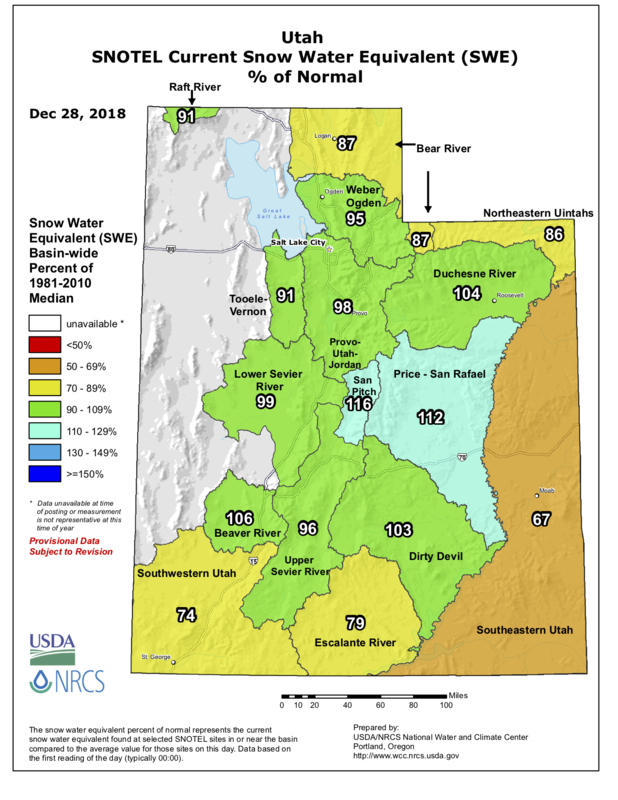 According to the Natural Resources Conservation Service’s Utah Snow Survey, some Utah regions have snow water equivalent above the median, such as the Price River San Rafael Region at 112 percent and Duchesne River basin at 107 percent. Powder Mountain Ski area in Weber County reported it had received 8 new inches of snow in two days’ time and a Ski Utah snow report released Wednesday said 11 inches of new snow was adding to a 40-inch base at Brian Head.